Beckingham Shipyard was founded in 1889 by Mr Joseph Spencer Compton Watson. He was the son of a Congregational Minister who after some engineering experience started building barges in 1869 on the Thames at Blackwall. For reasons unknown he decided to bring his business to the Trent and being unsuccessful in buying land on the Gainsborough side of the river he bought a small area in Beckingham Parish consisting of 2 acres of Poor Dole land and 1 acre 32 Perches from Scrooby Court, or their successors, awarded at the time of the enclosures in 1779. He moved his yard here in 1889 bringing both equipment and some of his workforce from Blackwall and possibly from Fulham. His sister lived in Willingham, Lincolnshire, which may have influenced his move to the area. 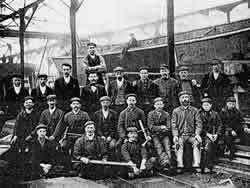 The business prospered and as well as the shipyard and offices a number of workmen's houses were built in the village. Some have since been demolished but six in Trent Road past the railway crossing and four on High Street are still standing. Beckingham benefited from Mr Watson's philanthropy, when he built the Institute and adjoining houses in High Street, which provided a Library, Reading Room and Café. The village still benefits from this today, though the facilities have changed. Joseph Watson died in 1917 aged 72 years, having retired some years earlier, when the running of the yard was taken over by his nephew Spencer Watson. Spencer maintained the reputation of the yard, which at one time employed as many as 400 people, continuing to build high quality vessels sent to many parts of the world. They were contractors to the Admiralty, Crown Agents for the Colonies, Dominion Governments, Foreign Governments, Railway Companies of the World, Principal Shipping and Lighterage Companies. Steel craft of all types were built at the yard, from 20 and 1,000 tons and up to 150 feet in length for launching and 250 feet in length for shipment abroad in pieces of riveted and welded construction. These included Coasting Vessels, Steam and Motor Tugs and Lighters, Petrol and Oil carrying Barges, Hopper Barges, Fishing Vessels, Pontoons and Tanks and Dredgers. 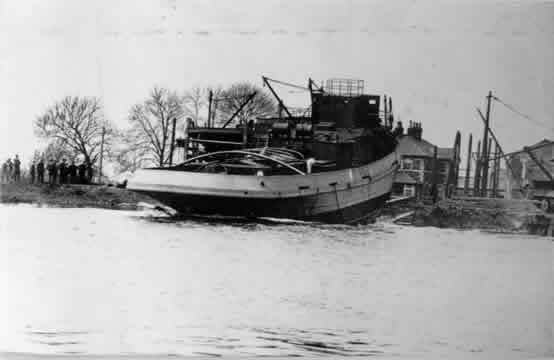 The completed boats were either launched into the Trent or they were packed in pieces to be sent by rail to Hull from where they were shipped to the port of reassembly. Shipment was a speciality. When dimensions allowed they were sent out complete as deck cargo on the export steamers to various parts of the world. Sometimes the larger craft were sent out in sections in order to give less work in reconstruction. 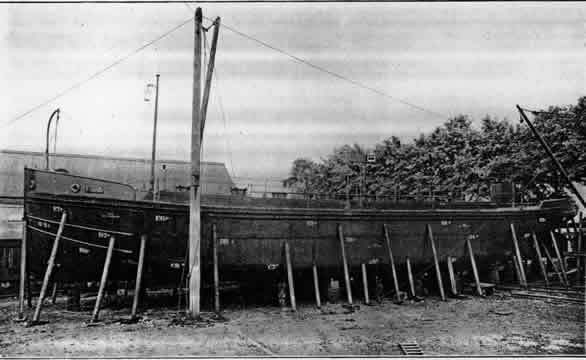 In most cases the craft were fully erected in the yard, bolted up, painted different colours port and starboard, marked up to assist reconstruction in accordance with the key plan, then photographed before being packed and bundled in wooden crates and delivered to export steamer, with all bolts and rivets for completion. When shipped in pieces, the craft was packaged, where possible, to weigh no more that 2 tons or be no more than 35 foot in length. 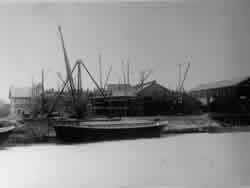 There is an album of photographs of completed boats in the Retford library. In the early days most of the trade went abroad. 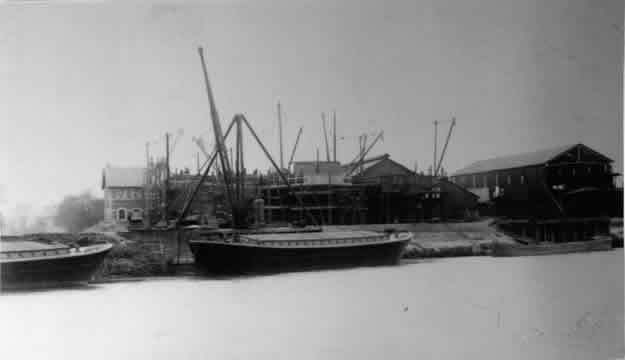 At around the turn of the century, Watson's had begun building inland waterway craft for the Humber area. By the end of the First World War the company were building three of their longest ever vessels to the order of the Admiralty, one described as a 180 foot by 31 foot sea-going barge. The yard managed to survive the depression of the 1930's and until the 1940's many craft were built for work on the Trent, though they were restricted in size to a length of 82 feet 6inches. During the 1940's work in the yard concentrated on the war effort. 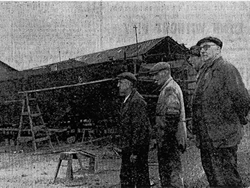 After the end of hostilities in 1947, work stopped for a number of weeks due to serious flooding of the entire site when the Trent burst its banks. 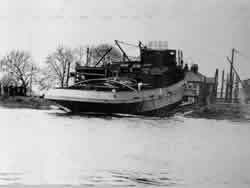 In the 1950's the emphasis was on Hopper Barges for UK and overseas ports as orders for more conventional craft diminished. In the end most products made were items such as catamaran fenders, lock gates, pile driving flats and various platoons. A trip to the yard by schoolchildren in 1956 describes them seeing a fresh water carrying barge being built for service for Royal Navy in the Far and Middle East. The barge had a displacement of 50 tons and could carry 60 tons of fresh water in 4 compartments. The decks being specially cambered and the hatch covers designed to prevent any sea water breaking over the vessel from entering into the fresh water and contaminating it. They also saw a food carrying barge being built, again for service in the Far and Middle East. It had a four inch layer of granulated cork enclosed between 2 layers of duraliminium as insulation, to keep the food cool. The hatch covers were insulated and when closed the hold was completely airtight, keeping the desired temperature maintained for 48 hours. This test was applied by the Admiralty before the vessel was taken over. A vessel was launched into the water at high tide, by two gangs of men, one on either side. When the order was given each gang began to simultaneously knock out first the middle set of wedges, followed by the front set and finally the set at the stern of the boat. The boat settled onto its runners in the well lubricated grooves and slid slowly into the river to the cheers of the children. In midstream three men on board dropped anchor, steadying the vessel and a tug towed her in to berth. The death of Spencer Watson circa 1956/57, probably precipitated the inevitable closure of the yard. After his death the yard was then run by his widow Amy and two daughters Kathleen and Nora, along with a manager, Mr Colin Norman. 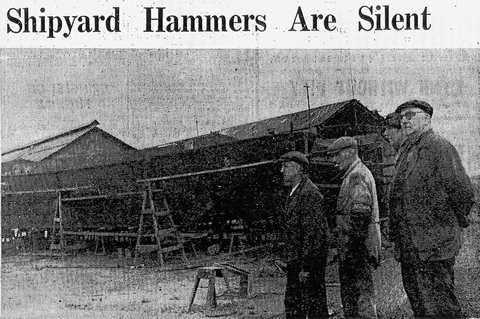 However, post war lack of orders caused the yard to be closed for further work in May 1962. The yard was put up for sale but no bidders came forward. 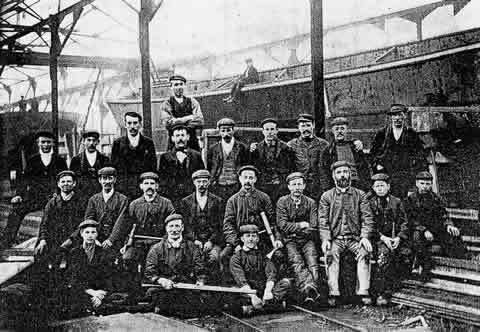 A skeleton staff was kept employed until 1964 to deal with the sale of movable equipment and tools, along with the completion and dispatching of the last two boats. 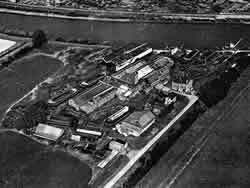 In 1965 the derelict site and buildings were bought by the Stockdale Brothers, Clarence and Bernard of Tuxford, who formed the Trent Wharfage Co. Ltd. with the site to be used for warehousing. It was later acquired by Kenneth Wilson and Bungay & Co. and in 1996 it was bought by Mr Michael Parkes. The wharf was unpopular with Hull dock workers and in 1974 it was blockaded by Hull lightermen, who aimed to keep the wharves occupied with conventional barges and coasters, thus preventing Bacat barges from berthing or being unloaded. Bacat barges came ready loaded direct from the continent, but lashed to a mother ship for the sea crossing. The coming of Trent Wharfage necessitated the strengthening of the Trent Road from near Beckingham railway signal box to the River Trent by Nottinghamshire County Council. Some lengths of roadside ditch were piped and passing places constructed. 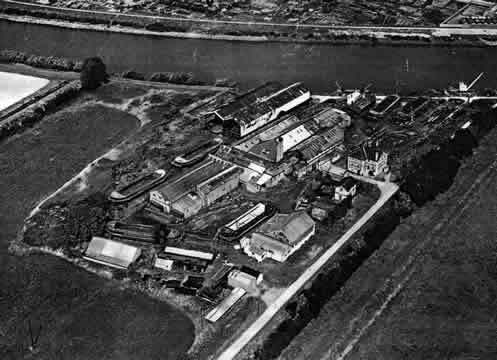 At about the same time that Trent Wharfage came to Beckingham, John Brash bought the area to the west and north of the old shipyard site and established a timber yard which specialises in tile laths, their move being to avoid difficulties at Hull docks. The area bought by Brash's was some land allotted in 1779 to Mary Royston of 2 acres 11 perches and to Wharton's Charity of 6 acres. The two above mentioned were badly affected by the floods of 1977 and they eventually constructed a flood bank surrounding both sites. This was not put to the test until November 2000, when it was found to be partly, but not completely successful. Pumps have been installed which will improve the situation in future floods.